Get out and enjoy winter! Late February and early March are some of the best times of the winter - the daylight is returning more each day, the sun feels warmer, and there are some amazing events that take place to heat up the last few months of winter. This Saturday (Feb. 22), ten teens will take to the trails as the Junior Iditarod begins at 10 a.m. from Martin Buser&apos;s Happy Trails Kennel in Big Lake. The Junior Iditarod is 150 miles, along the Iditarod Trail to Yentna Roadhouse and back. The Junior Iditarod is where many of the most well-known Iditarod mushers got their start. The following day (Feb. 23), human-powered athletes take center stage. The annual Iditarod Trail Invitational is a grueling race - 350 miles from Knik to McGrath, with racers using only human-powered methods in some of the harshest conditions. These hearty racers, who come from around the world to compete, walk, snowshoe or ride a bike across the Alaska Range. Some even continue on to Nome, competing in a 1,000-mile version. Racers routinely find deep snow, temperatures that can dip to -40 and conditions most couldn&apos;t tolerate. Yet they push on. You can catch the start of the race on Feb. 23 at 2 p.m. on Knik Lake. Of course, you don&apos;t have to be a dog musher or a super endurance athlete to enjoy this time of year. There are plenty of other ways to shake off some of that winter rust. Check out www.alaskavisit.com/trails for maps of local trails where you snowshoe or ski. You can also head up to Hatcher Pass for some incredible Nordic skiing and snowshoeing. The same holds true up the Glenn Highway National Scenic Byway, where excellent ski trails exist. Or gas up the snowmachine and head north to Petersville on the Parks Highway or Lake Louise on the Glenn Highway. 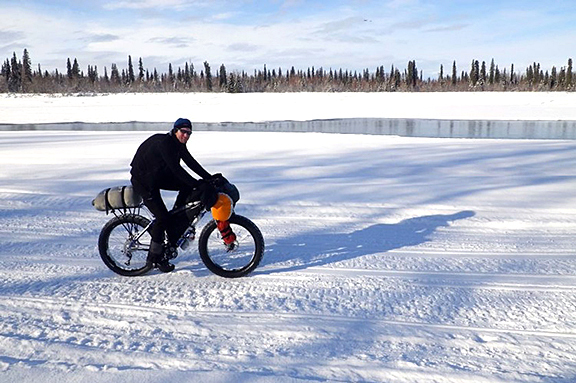 Winter recreation abounds in the Mat-Su Valley - you just have to venture out with your sense of adventure!